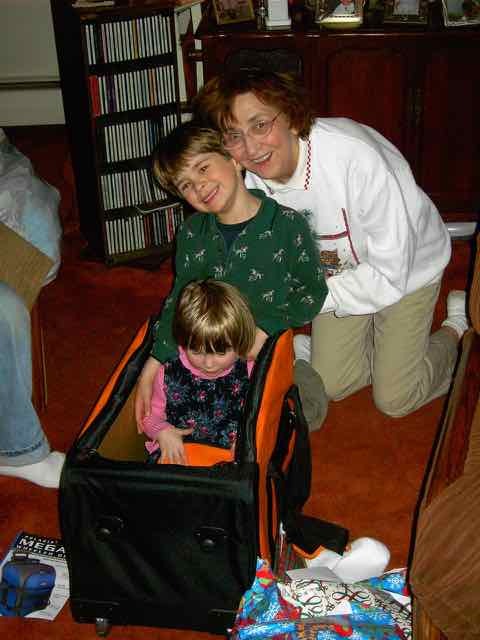 Margaret Lozinak Lawrence with grandchildren Miranda and Anthony Lawrence in 2006. Margaret Lozinak Lawrence 1924-2016 — Margaret Jane Lozinak Lawrence, a 54-year resident of Springfield, Pa., died June 10 at the Hospital of the University of Pennsylvania. She was 92. She was described by those who knew her best as the kindest, most loving and gentle person they had ever known. She was always willing to lend a helping hand to those in need. Mrs. Lawrence was born in Eckley, Pa., to Michael and Catherine Lozinak. Michael was a coal miner. She was one of 10 children. Mrs. Lawrence enrolled in the nursing program in the Old Blockley at Philadelphia General Hospital (PGH) after graduating from Foster Township High School. She always felt that Blockley was the best nursing school in America. Her inspiration was her older sister Mary “Mame” Lozinak who served as a nurse in World War II and would make a career of the military. After graduating from PGH, Mrs. Lawrence joined the U.S Army’s Nurse Corps. She served in the Korean War with the 11th Evacuation Hospital. A quote from her is inscribed on one of the pillars at the Delaware County Veterans Memorial in Newtown Square. She was among the recipients of the 2015 Delaware County Freedom Medal and participated in the inaugural Philadelphia Veterans Day parade, last fall. Mrs. Lawrence returned to Philadelphia and continued nursing at the city’s Veterans Administration Hospital. She married William Lawrence in 1959 and became a full-time mom to three boys, William II, Robert and Christopher. She returned to nursing part-time when her sons started school, first at the Philadelphia VA, then at Bishop Nursing Home in Media. 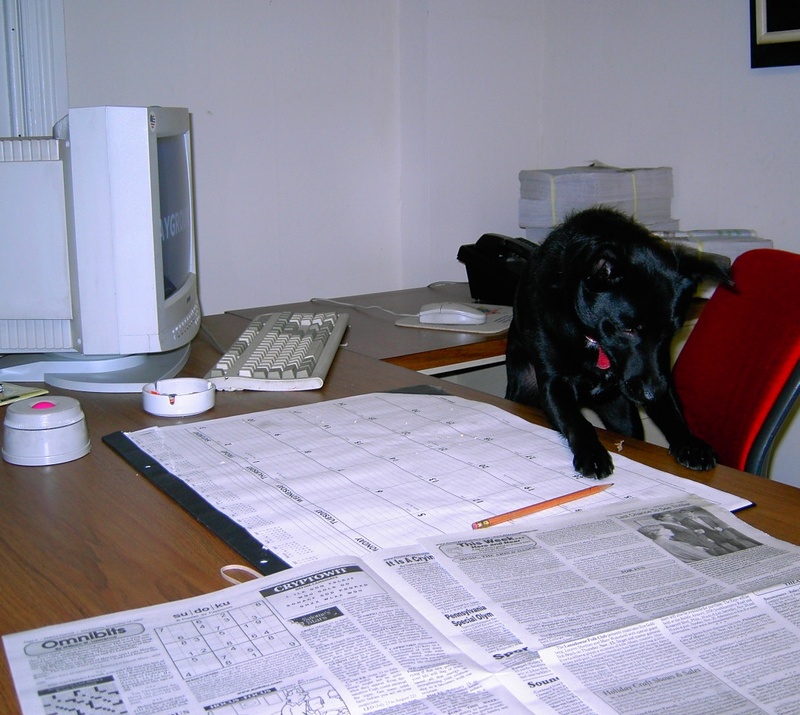 In 1992, she gave up her nursing career to become office manager of the family business, the Garnet Valley Press, a job she held until 2008. She enjoyed taking long walks with her dog, Peewee, and helping her son William make wine. During her three-week hospital stay, her biggest concerns were celebrating her granddaughter Miranda’s birthday and a Father’s Day party for her husband. She had a joy for life, her mind was great until the end and her last words were literally laughter. She is survived by her husband and sons; her daughter-in-law Cynthia;, her grandchildren, Anthony, Miranda, Kyley and Skyler; sisters Elsie and Dorothy; and numerous nieces and nephews. Visitation will be 9:30 a.m., Friday, June 17, at Holy Myrrh-Bearer’s Church, 900 Fairview Road, Swarthmore, PA 19081 with a service to follow. In lieu of flowers, donations may be made to Holy Myrrh-Bearer’s. Police Save Man From Suicide By Cop — Springfield (Pa) Police saved a man from suicide by cop, Thursday, May 26, after a tense four-hour standoff at his home on Hillview Road near Wayne Avenue. The incident started about 6:15 p.m.
Shawn Delaney, 50, who had been drinking all day, begged police to shoot him and fired three shots out his window in their direction. Police were called to the home for a domestic dispute and found the man’s wife and daughter from a previous marriage sitting on the curb. The wife informed officers about his condition and that he had grabbed a gun and fired two shots in the house albeit not in the women’s direction. Delaney lost a daughter to a drug overdose in December and is serving weekends at county prison for a drug possession. A man who was renting space in the house and fled told police Delaney was in the master bedroom holding a shotgun to his neck. Police said that when officers attempted to contact him via direct communication — he had no phone — Delaney fired at them, shouted obscenities and asked to be shot. Police smashed open the front door and inserted a camera-equipped robot into the premises about 8 p.m. shortly after a second male tenant also fled. With there being no chance for a hostage situation a decision was made to wait him out says Police Chief Joseph Daly. The robot kept a watch on Delaney until he fell asleep at which point he was arrested. Delaney was taken to Mercy Fitzgerald Hospital for a psychiatric evaluation. He is facing multiple counts of attempted homicide and related offenses. 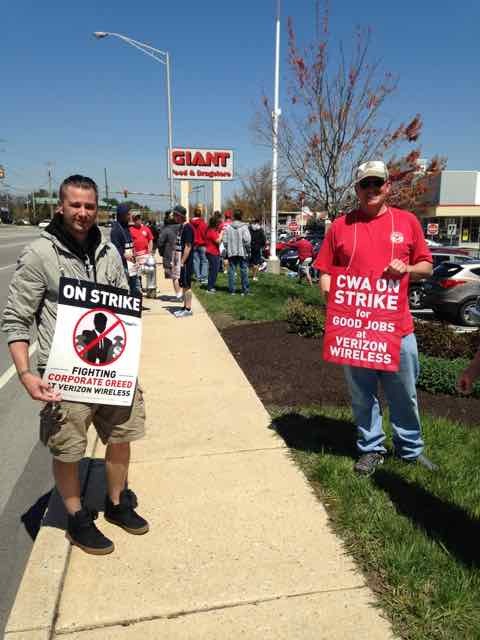 Verizon Springfield Picket Line — Verizon workers Tim and Kevin man a picket line, today, April 15, on Sproul Road, near the Verizon store in the Springfield (Pa) Shopping Center. About 36,000 Verizon workers have been on strike since Wednesday over concerns about planned cutbacks in the company’s landline business and off-shoring jobs. 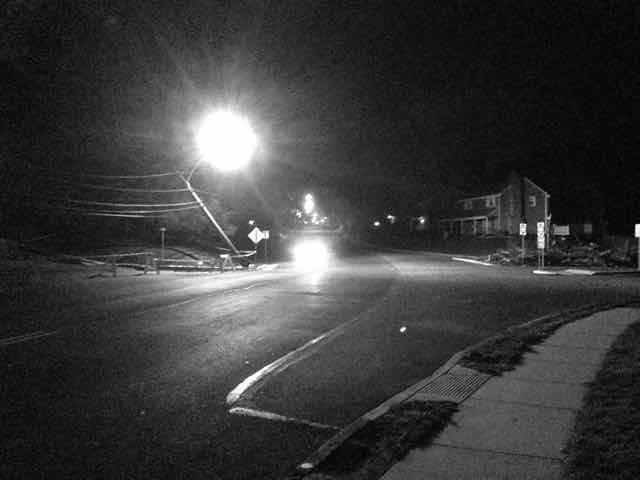 Springfield Streets Closed By Fallen Tree — This is Springfield Road at South Rolling Road in Springfield, Pa. shortly after 11 p.m., April 3. South Rolling was still blocked at the intersection and the street light there remained an an obtuse angle. A windstorm that morning felled a large tree knocking wires into South Rolling and closing off the street at Cascade Road and Windsor Circle. Power was out for about an hour in the afternoon while PECO did repairs. Kudos to the township for a fast response. 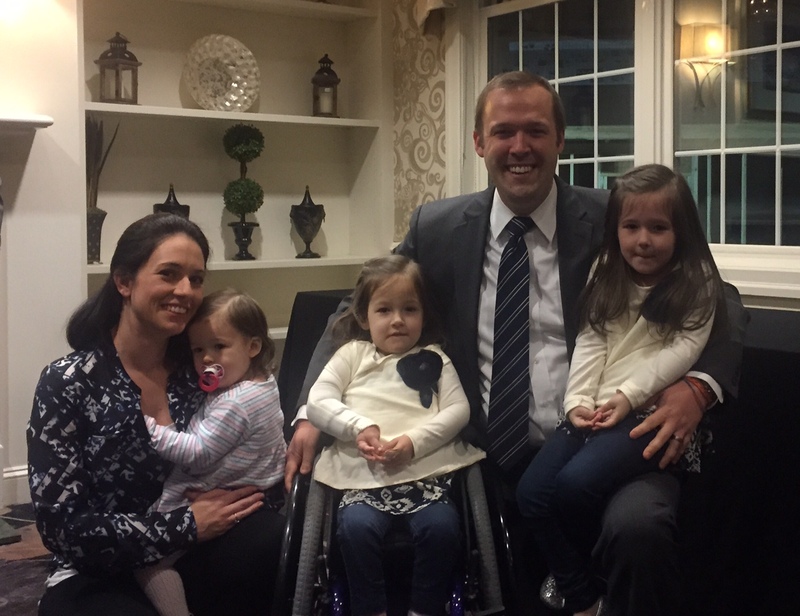 Alex Charlton with his wife, Kira, and their children. Alex Charlton Tapped By GOP For 165th Race — The Republican Committees of Springfield, Marple, Radnor and Morton, last night, Jan. 21, endorsed Alex Charlton of Springfield to replace Bill Adolph as state representative for the 165th Legislative District in the Pennsylvania House of Representatives. Adolph, who has represented the district since 1988, has announced he will not be seeking re-election. Charlton, a former president of the Delaware County Chamber of Commerce currently serves as chief of staff to state Sen. Tom McGarrigle (R-26). Charlton was nominated by Colleen Caceci, a Springfield Township Republican committee member. Charlton says he will make improving public schools a priority. Charlton took a veiled shot at the Keystone Exam, a Common Core-type standardized testing program now being instituted in Pennsylvania schools. Charlton also recognized the importance of police and emergency responders. He also said he understands the importance of preserving parks and open space. “We need to make sure we’re protecting and expanding parks and open space in a responsible manner so that our communities can enjoy all that they can provide,” he said. The primary election is April 26. 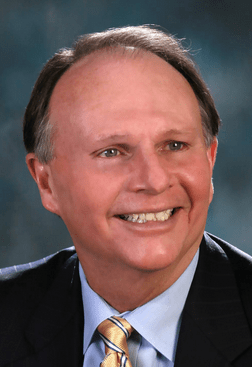 Bill Adolph Tribute –Bill Adolph has announced that he will not seek re-election which will mean that come 2017 the 165th District in the Pennsylvania State House will have a new face for the first time since 1989. The 165 District consists of all of Morton Borough, most of Springfield and Marple Townships and a large part of Radnor. Specifics can be found here. Since this blog came into existence, we’ve probably been harder on Bill more often than not — actually we have been seriously hard on him at times — but we will never deny he cares deeply about his community. A Springfield resident, he has lived in the same house off Springfield Road for as long as we can remember, and the same can be said about his accountant’s office on Saxer Avenue. He was easy to find and easy to approach and if he wanted to hold the seat for another 28 years we suspect he’d have no problem doing so. And he’s done a lot of good things too, most recently doing yeoman’s work in keeping Gov. Wolf from dumping a brutally crushing new tax burden on his constituents. So Godspeed Bill. Hopefully you stay in Springfield and stay active on the political scene. Now, regarding those who seek to replace him regardless of party registration, we have your issue. The (non-partisan) Springfield School Board has approved a new high school with an estimated cost of between $118 million and $140 million. The Pennsylvania Prevailing Wage Act of 1961 requires wages to be paid at an amount set by the Bureau of Labor Law Compliance. This law inflates the cost by perhaps up to 40 percent albeit 20 percent seems to be the consensus. Using the lowball estimates, simply repealing the law — and it doesn’t have to be replaced with anything — would save the Springfield taxpayers $23.6 million on this project alone. And of course, other communities would save in the same proportions for all county, school and municipal projects. Repeal should really be a no-brainer. And so there you have a winning issue, candidates for the 165th District. There has been an epidemic of drivers traveling the wrong way while going south on North Rolling Road in Springfield Pa at Windsor Circle. 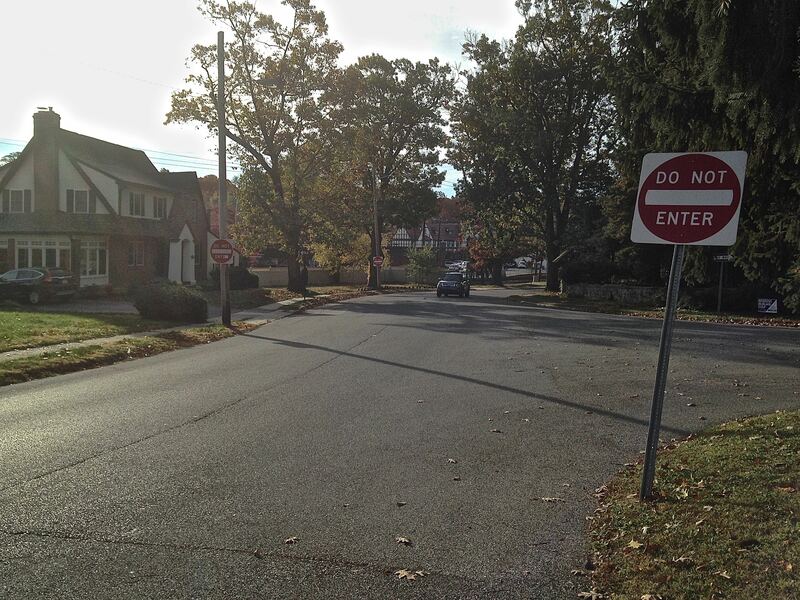 The township has placed three “Do Not Enter” signs and two one-way signs where North Rolling forks around Windsor Circle. The plagues continues, however, and now we can reveal why. One confused motorist made the turn around the traffic island, saw the signs and asked for help. It was her GPS that was sending her that way she said. Apparently the various services don’t realize the road forks. Springfield GOP Chairman Mike Puppio noted at tonight’s (Oct. 21) township party meeting that Delaware County Council has not raised taxes for two years and has not cut services. The Republican County Council slate consists of incumbents is John P. McBlain, Colleen P. Morrone and Mike Culp. The election is Nov. 3. The big box stores have a bad rep but we’d like to praise the Best Buys on Baltimore Pike in Springfield, Pa.
Springfield Township, like most, won’t accept electronics in the trash stream. Our old TV died and we needed a new one. The township charges $50 to dispose of unwanted televisions. 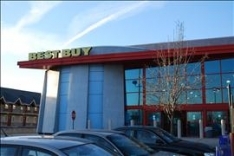 Best Buys, however, has allowed the township to refer it to those who need to dispose of old hardware. And so we went. There was no hassle, they just slapped a tag on it and had us put it in a shopping cart. We were free to go. We didn’t have to buy anything. Of course, we did even though we had not planned on getting our replacement there. Will Walmart and the other brick and mortar appliance dealers do the same? If yes, they ought let let the municipal governments know about it and ask them to promote it. It is a service the web retailers will find it tough to match.